organized a 4th birthday party for their son Owen at a local ice rink. Though Guilliana doesn’t know how to skate at the moment, you should have seen the excitement on her face when she learned the party including public skating! Owen, being a huge hockey fan, couldn’t have chosen a better place to have a party. Guilliana picked out the perfect gift for Owen since he loves our arcade-sized Chexx Canada vs USA bubble hockey game. G selected the Sure Shot table hockey game and she told Owen that next time we stop by, he will have to play her daddy, for the title of “Table Hockey Champion”. 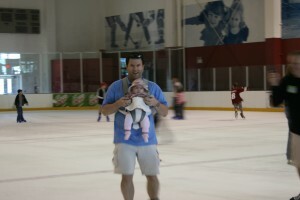 Here are some pics from G’s first ice skating experience.